To paraphrase a cliché, she’s mad as hell and isn’t going to take it anymore. 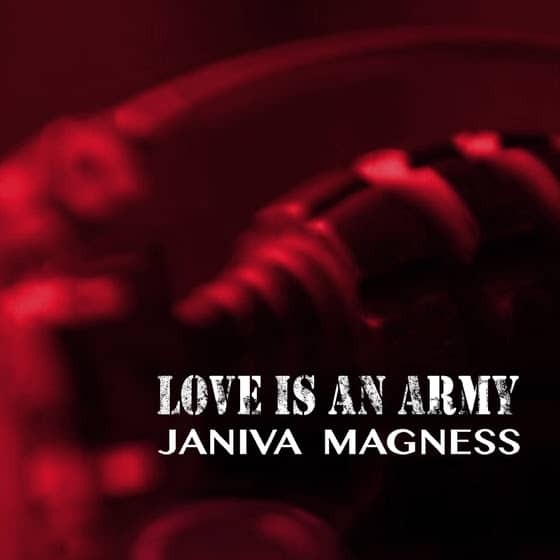 Look no further than the out-of-focus hand grenade featured on the blood-red drenched cover of blues/soul singer-songwriter Janiva Magness’ Love Is an Army set for a sense of the emotionally and socially explosive contents inside. Upset with the divisiveness driven by the current political climate, Magness delivers a dozen songs, most co-written either by her or veteran producer/guitarist Dave Darling, advocating compassion and love. While that message on its surface may seem simplistic, the passionate performances and Magness’ dynamic vocals will have even skeptics singing along to choruses such as “Reach your hand out — tell me what’s that say about you” with the same Mavis Staples-styled fervor she brings to these tracks. There’s no doubt about her position as she sings, “Peace of mind is hard to find/ here in the world today” on “Home,” with vocal assistance from Cedric Burnside, and few would argue with that view. When she lays into the gospel of the closing “Some Kind of Love” with just piano accompaniment and “It’s going to take some kind of love/ to cure all this pain” lyrics, her husky vocals and intense delivery show there is no mistaking how seriously she wants to turn things around. Once pigeonholed as a soul/blues purveyor, Magness has since widened her boundaries for a more inclusive musical direction. To that end she brings in Poco co-founder Rusty Young who contributes pedal steel to the country strum of “On and On.” It’s an intimate personal account of her own missteps in life and romance where she admits, “I’ve been fighting myself — but I never seem to win,” atop a sweet, singalong melody beautifully enhanced by Young’s stellar work. Pedal steel also enhances the tough “Love to a Gunfight,” a concise summation of this disc’s overall theme that love is stronger than hate. Selections like the title track ballad comfortably mix blues, gospel and pop, with Magness’ voice soaring above it all as she sings, “If love is an army/ sadness the enemy/ You know I will fight for you.” You’ll need a hanky handy after hearing the singer return to her soul roots on a riveting version of Paul Thorn’s regretful “What I Could Do” with journeyman Delbert McClinton bringing his distinctive gritty pipes for a duet on this moving moment. The opening Magness/Darling co-write “Back to Blue” is another rousing mid-tempo church-infused gem, one of this album’s highlights and arguably Magness’ finest original. While Magness has never been a shy performer, there is a steely attitude running throughout Love is an Army. She’s one of the few artists unafraid to champion her opinions on a release that’s as aggressive as that hand grenade and just as powerful.